2004 will mark Vinnie's second year behind the wheel of a full size race car. Vinnie, a former, Jr. Drag Racing League competitor, started his driving career in 1994 behind the wheel of the original car for the team, and won for the first time at Old Bridge Township Raceway Park. That was only the beginning. In 1995, Vinnie again shared the Tax Bracket Racing 1993 Half-Scale Jr. Dragster with his brother, finishing seventh in points at Island Dragway. Towards the latter part of the season, Vinnie was asked to drive another car for a few races, and won the Consolation Race during the Fall Nationals at Island Dragway. The 1996 season found Vinnie driving the Help Our Team Rub Out Drugs (H.O.T.R.O.D.) Jr. Dragster. Vinnie qualified for the 1996 Jr. Drag Racing League National Championships, but went out in the first round. He visited the Winners Circle three times that season, and finished fourth in points. Vinnie got a car of his own in 1997, and made sure that everyone knew it. He went out and won the track championship at Island Dragway, beating out his brother, and won a career high seven races in seven final rounds visited. Vinnie also went to the Ziploc Indy Jr. Dragster Open, and went five rounds in the Friday night bracket race. 1998 was much the same as Vinnie once again beat out his brother, winning five times en route to capturing the Island Dragway track championship. He qualified for his second National Championships, but again went out in the opening frame. During the 1999 season, Vinnie racked up three wins, and finished number two in the Island Dragway points program, making it the third straight year that Tax Bracket Racing finished one and two in the points standings. He also finished in a tie with his brother for fourth position in the points at Old Bridge Township Raceway Park in Englishtown New Jersey. 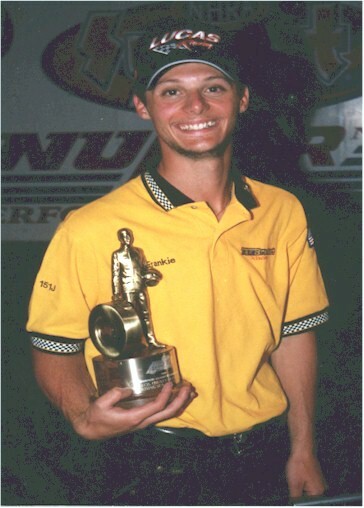 In the first year of the new Millennium, Vinnie ended up number two at Old Bridge Township Raceway Park in his second year competing there for points, finishing behind Class D and 2000 NHRA Jr. Drag Racing League Eastern Conference Finals Champion Joe Santangelo. Vinnie extended his career win total to 36 after capturing the coveted winner's trophy thirteen times during the course of the season. He qualified for the first annual Eastern Conference Finals, but unfortunately went out in the first round. He also made his fourth straight appearance in the Race of Champions event held at the Division 1 Championships, and qualified number one before a blown motor ended his run in the second round. 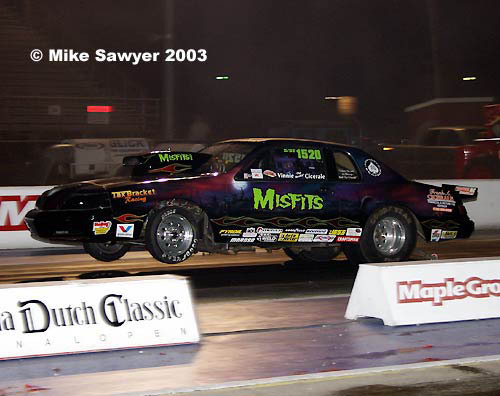 In 2001, Vinnie re-claimed his title at Island Dragway, knocking down seven wins on his way to the track championship. He also finished second in points at Old Bridge Township Raceway Park in Class D competition for the second straight year. His biggest win, however, came at the Division 1 event held at Mason-Dixon Dragway. After five years of trying, Vinnie finally went the distance in the Race of Champions event and won for the first time. 2002 marked Vinnie's final season behind the wheel of a Jr. Dragster. While it was a disappointing year at Island Dragway, Vinnie made up for that disappointment by taking home Old Bridge Township Raceway Park's Jr. Dragster Class D track championship. Vinnie knocked down six win and again qualified for the Race of Champions event held at Mason-Dixon Dragway. Vinnie made it a career year in 2003, his first year behind the wheel of a full-size race car. Vinnie only won three events last year, but two out of the three were the biggest wins of his career. Vinnie finished seventh in Street Eliminator points at Island Dragway and went on to win the NHRA Division 1 Bracket Finals in his 1982 Chevy Monte Carlo in his first attempt. 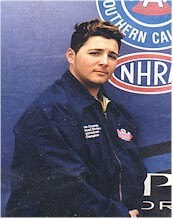 Vinnie then went on to take home the NHRA Sportsman Eliminator World Championship with a win at the NHRA Finals in Pomona California, becoming the first Jr. Drag Racing League graduate to score a national championship. Vinnie also had a solid year in his 1987 Ford Thunderbird. Running the car on the divisional trail in Super Street, Vinnie finished seventh in the Northeast Division Open Series Super Street points chase.